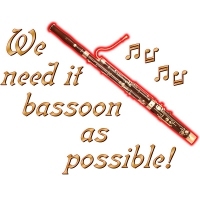 This whimsical design is sure to please the bassoonist or bassoon student or teacher in your life. Or maybe you’d like it for yourself! Get it now on a t-shirt or mug or other giftware item!